Search new home builder sites below and thru MLS here. Please put Alicia Duffy down when you register so builder knows we helped you find them! For full service or rebate contact us before your first visit to the model. Remember as awesome and nice as the salesperson is they still represent the builder and your Realtor cost you nothing! Realtor representation does not effect pricing of new home builds and is at no cost to you! Sellers (including builders) already pull those fees out before pricing the property. Whether you have someone representing you or not does not change the process. Well....it might change the cost to you in the longrun without a professional negotiating on your behalf. Contact us today and we'll do the search for you of all builders current inventory, including price incentives offered. Don't need any help finding or negotiating with a builder? Take our Rebate card with you and get money towards your closing! Plus you'll have a back up if you have questions or need advice during the process! 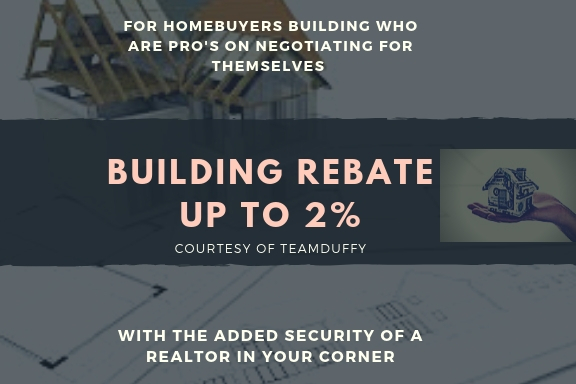 Use the rebate to sell your current home for free!